A young couple on the move build a small home that will go wherever life takes them. Brian and Joni Buzarde’s self-designed home sits on a customized chassis by PJ Trailers that’s just eight and a half feet wide. The 236-square-foot trailer is clad in cedar. While most trailers are oriented horizontally, the couple arranged theirs more like a cabin, with distinct areas for different functions. Container Store finds, like galvanized-steel shelving in the kitchen, maximize storage. The birch-plywood cabinets, floor storage space, and banquette were all designed and built by the couple. Learning as they went, they opted for an industrial look for plumbing and electric. “We knew we didn’t really have the skill to be fussy, so we just embraced that and went with it,” Brian explains. A 55-inch Samsung Smart TV, a gift, is one of few indulgences. The sleeping loft features a Velux skylight. Structural insulated panels by Vantem keep heating costs down in almost any climate. Milgard sliding doors were added with the future in mind. “We really wanted it to feel big since we planned to live in it full-time,” Brian says. Structural insulated panels by Vantem keep heating costs down in almost any climate. As Brian and Joni Buzarde closed in on their 30s, they were eager to settle down in a place of their own. But there was a problem: Neither knew where their fledgling careers would take them. So they devised a solution that was unorthodox but practical, and they built a house that could go with them no matter where they ended up. Their 236-square-foot trailer—which Brian’s brother, Brandon, nicknamed Woody—has made upward mobility possible, having moved with them from Austin, Texas, to the Rocky Mountains hamlet of Marble, Colorado. 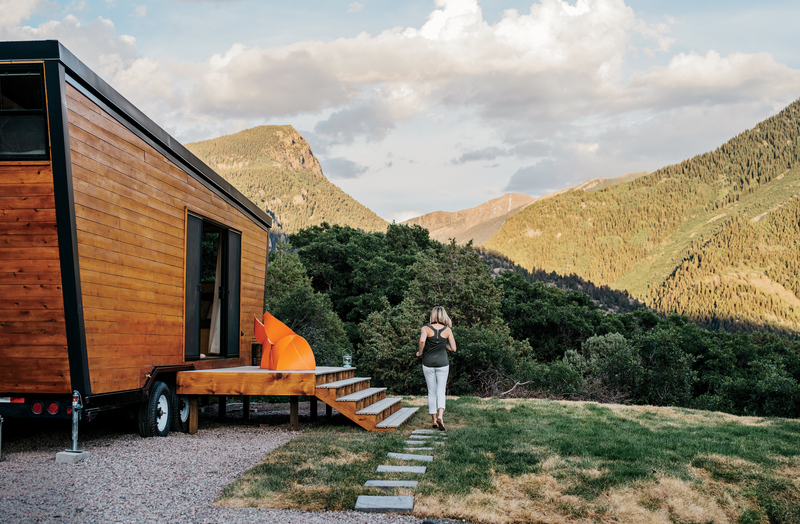 Before finding its current mooring, this modern backcountry cabin on wheels was nestled in a trailer park not far from cattle ranches and wilderness trails, where the couple’s home stood apart from the clunky double-wides and anchored Airstreams that surrounded it. They started by purchasing a 26-foot-long flatbed chassis for about $7,000 and then bolted on walls made from structural insulated panels—foam insulation sandwiched between sections of oriented strand board. The cedar-clad trailer is slightly taller at the back, giving it an angular, contemporary shape. It is eight and a half feet wide and reaches a height of 131/2 feet at its tallest point, reaching legal limits for highway travel without a special permit. As construction proceeded, they embraced their inexperience and opted to leave the plumbing and the electrical conduit exposed, reducing costs and giving the living spaces an industrial edge. “This place is a visual history of us figuring out how to do things on the fly, with a limited budget,” Brian says. Building a residence on wheels allowed them to sidestep the permitting process, cutting expenses and lead times. “I thought I would knock it out in a few months,” Brian says, but the project, which the couple squeezed in around their jobs, took about a year. Woody became their home in June 2012. The couple, who married in August 2014, plan to continue living in the trailer full-time until they start a family. Woody may be big enough to handle a 55-inch flat-screen television, a pair of fishing rods, and their dog, Sheba, but it would be a tight fit if children entered the picture. The trailer, which can be hitched to a pickup truck, isn’t that easy to move; it holds all their possessions and isn’t aerodynamic like a typical recreational vehicle. When the time came, however, Woody hit the road one last time. Fulfilling their dream, the Buzardes bought a five-acre piece of open space in Marble, Colorado, where they parked Woody permanently.